Home to stunning landscapes, rugged mountains, vast wilderness areas and enormous national parks, Tasmania is an interesting destination to visit in Australia. I spent more than a week here and I must say it was by far the best trip I had in land down under. Tasmania is a wild and beautiful place to explore. It has rich wildlife and many spectacular natural wonders that made me excited about this incredible destination while I was still creating my Tasmania travel itinerary. It has a unique charm that made me easily fell in love with this place. Tasmania is an isolated island state off Australia’s south coast and the only island state in the country. 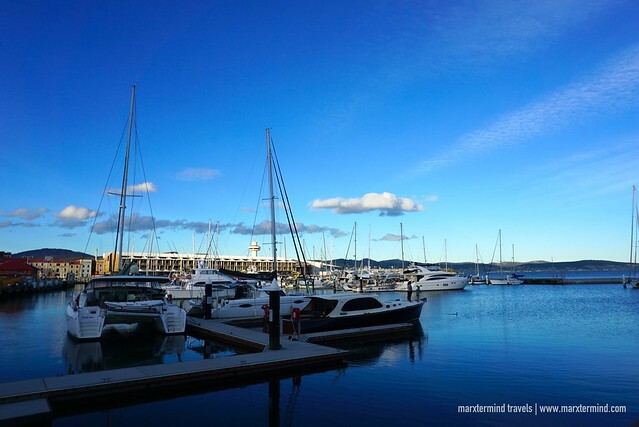 Hobart is its capital city, which is a lovely destination with lots to do in and around the area. Other places to visit and include in Tasmania travel itinerary are Launceston, Devonport, Burnie, Port Arthur, Coles Bay and many more. How to go to Tasmania? Major air carriers in Australia like Qantas and Virgin Australia, as well as low-cost airlines like Jetstar and TigerAir operate regular flights to Tasmania from popular cities like Sydney and Melbourne. 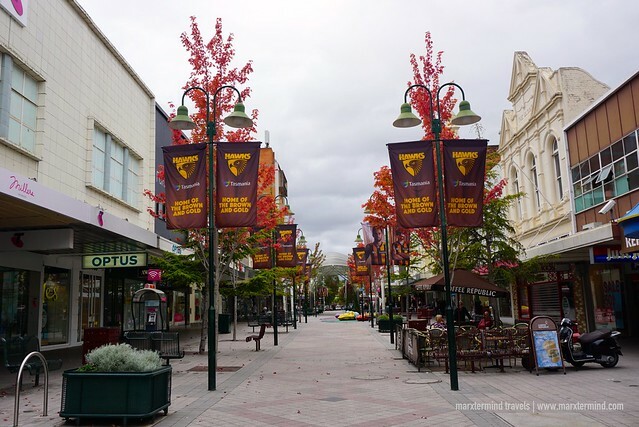 Launceston was the starting point of my Tasmania travel itinerary. From Sydney, I flew to Launceston and stayed for three days. Then, I went to Hobart and spent the rest of my Tasmania holiday there. 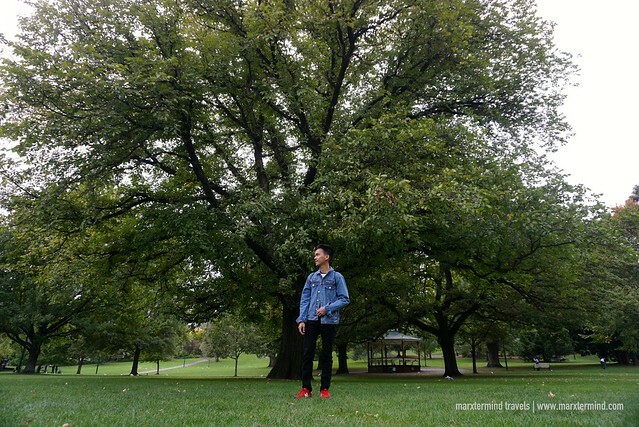 From Hobart, I flew to Melbourne then back to the Philippines. Buses are the main form of transportation in Tasmania. There are also taxi and Uber to take you around. If you would like to go on tours, there are also group tours that you can join to. But if you know or you’re with someone who knows how to drive, I would suggest renting a car. I find it more convenient and you’ll have more time to go places. You’ll definitely going to be able to see more in one week here. I arrived in Launceston early morning. At the airport, there are taxis and shuttles available that run between the airport and hotels and accommodations in Launceston. The approximate cost of a taxi to Launceston is around $40 each way. But if you want a cheaper transfer, I suggest taking the shuttle, which what I did. The fare is $15 one-way. The shuttle is directly outside the terminal exits. The Sebel Launceston was my hotel, a perfect accommodation for my Tasmania travel itinerary. It has a convenient location and just a couple of blocks away from the central business district of Launceston. I just spent my first day in the hotel and going to the shops. I started my walking tour by going to the Penny Royal Adventures. It’s a 10-minute walk from the hotel. Penny Royal Adventures is a nice theme park with cliff walks, rock climbing, zip-lining, boat rides, panning for gold & ghost tours. 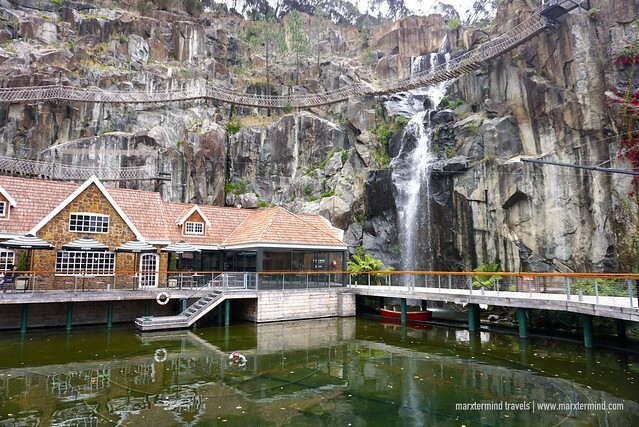 A riverside city, one of the famed tourist spots to visit in Launceston is the Cataract Gorge. It features panoramic views and walking trails. I went here after spending some idle time at Penny Royal Adventures. There are two walking trails but I chose the easier one which is on the right side of the river coming from Penny Royal Adventures. I was able to complete the trail for an hour. I loved the natural scenery and the beautiful view over the river. The walk is amazing and very much enjoyable. Part of my Tasmania travel itinerary is a visit to the City Park. Located close to the central business district, the City Park is also a heritage park and plays an important part of cultural life in Launceston. The park was established in the 1820s by the Launceston Horticultural Society and was handed over to the city council in 1863. Today, the park features many gardens, conservatory, duck pond, playground, and a series of memorials and statues. There’s also a Tasmanian Design Center and a Monkey Island, which houses a group of macaques that are separated from visitors by a glass wall and a small moat. 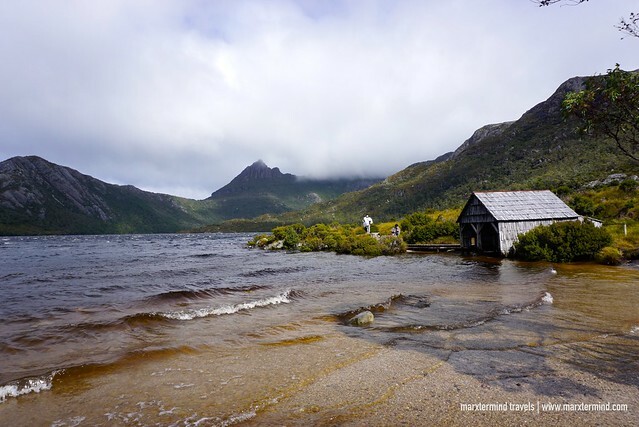 Known for rugged wilderness areas and most spectacular mountains, Cradle Mountain National Park is a must visit completing my Tasmania travel itinerary. 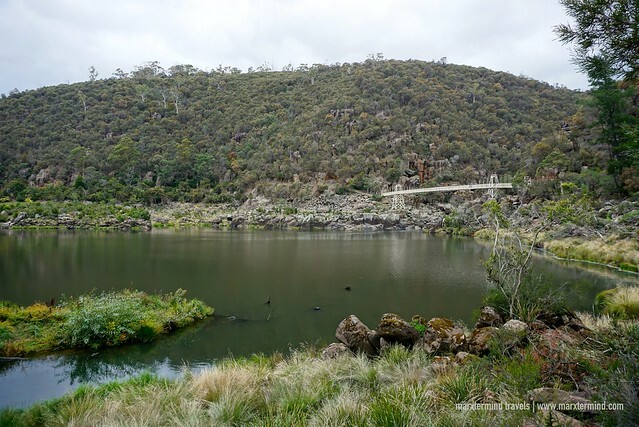 On my third day in Launceston, I joined a group tour going to the national park and spent a whole day touring around. Cradle Mountain National Park is one of Australia’s most beautiful national parks. Joining the tour, I was able to have a great experience to walk around the Dove Lake and enjoy the scenery and the remarkable views. Read more of my experience here. I left Launceston on my fourth day and took a morning bus to Hobart. The bus ticket costs $35 one-way per adult. The travel time from Launceston to Hobart is 2 hours and a half. It was already around noontime when our bus arrived in Hobart. I checked in to my hostel at The Nook Backpackers, then went to a nearby restaurant to have lunch. Then, I went back to the hostel to have some rest. I just went out before sunset and walked around the city and had dinner afterwards. 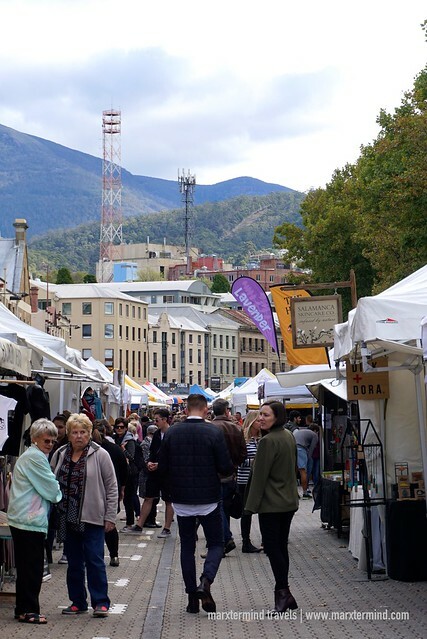 Salamanca Market is a top attraction in Hobart and must include in your Tasmania travel itinerary. It is at the historic Salamanca Place, next to the Hobart waterfront. It happens every Saturday with over 300 stall holders selling locally made products. Some of these include clothing, jewelry, organic produce, artworks, ceramics and leather goods, handcrafted cheeses, breads, wines and spirits, and delicious hot food and snacks. The market is open from 8:30 am to 3:00 pm. The Royal Tasmanian Botanical Gardens are located within the Queens Domain. It is about two kilometers from the city center. There are no regular buses that operate to the Gardens but there are various private bus and tour services that include the Gardens on its tour around Hobart. Since I wasn’t keen on joining one that time, I thought of just walking to the Gardens, which is a pleasant walk of about 25 minutes. 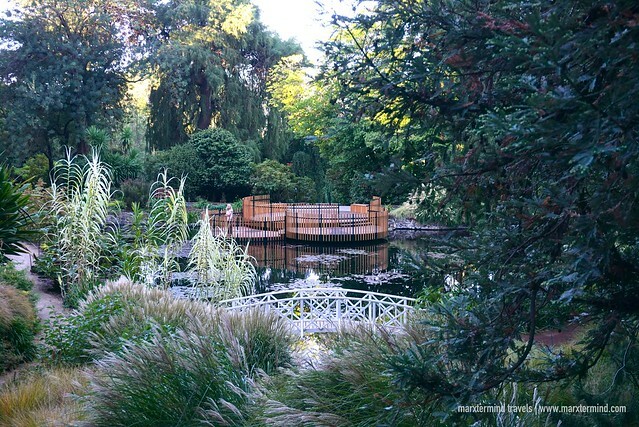 Admission is free at the Royal Tasmanian Botanical Gardens. Covering 14 hectares, the garden is huge that I spent almost 3 hours checking the place out. The garden showcases 6,500 species and varieties of plants, including over 400 Tasmanian species. Inside there are also Japanese Garden, Herb Garden, Tasmanian Fernery and lily pond. Aside from historic plant collections, there’s also a visitor center & a café. On my way back to the city center, I dropped by the Domain House because of its interesting architecture. The Domain House is a historic landmark that represents a significant part of early colonial education in the city. I arrived back in the city center just in time for sunset. I went to the Brooke Street Pier and spent the rest of my afternoon people watching and just enjoying the view. 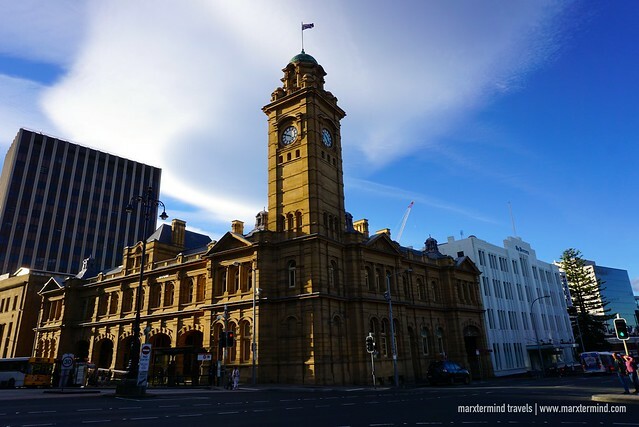 Some other spots to see around the town are Franklin Square, Hobart GPO Clock Tower, Maritime Museum Tasmania, Tasmania Museum and Art Gallery and many more. 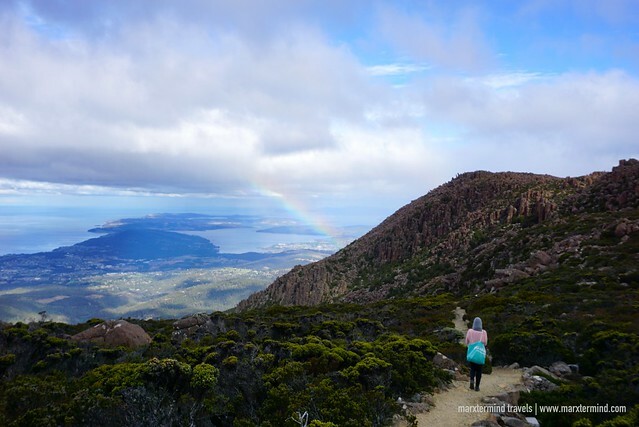 On the top of my Tasmania travel itinerary, I went to Mount Wellington with a fellow travel who I’ve met in the hostel. We were supposed to join the free car hire that the hotel arranged for us but our supposed driver backed out. We have an option to ride the shuttle going to the view-point but we found it expensive. So we thought of doing the more adventurous one, hiking. From the city center, we rode a public bus going to the The Fern Tree Tavern. From there, we followed the walking tracks going to The Springs. It wasn’t an easy hike I must say but the surrounding and the rainforest are incredible. We arrived at The Springs after about 45 minutes. We continued our hike following the trail but we were stopped by one of the workers. Funny because he told us that we obviously passed through the fence. But he was so nice that he pointed us the alternative trail that we could take. But that also means, we needed to go back to The Springs. Tired and hungry already time, I asked my travel buddy if we could just hitch hike. So we did. Fortunately, an old couple approached us and offered us a ride to the summit. The view from the top doesn’t disappoint. 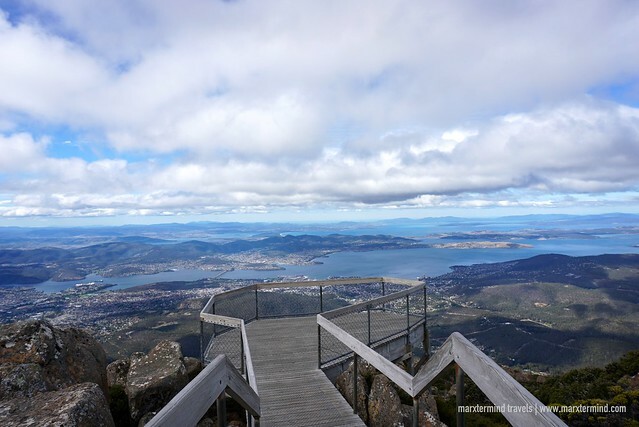 From the summit, one can have panoramic views of Hobart, Bruny Island, and into the South West Wilderness. We spent about half an hour enjoying the breathtaking view and the mountain scenery. It was also windy on top so make sure to bring your winter jacket. My travel buddy and I decided to hike again on our way down. It was easy this time. The trail was also enjoyable with a lot spot for photo opportunities. There are also scenic views on our way. It took us about an hour and a half to reach The Springs. But from there, we already decided to hitch hike again. Luckily for us, a nice family stopped for us and let us hitched a ride all the way to Hobart. Because our visit to Mount Wellington was a success, we treated ourselves with a delicious meal in one of the Asian restaurants in the city. Remember that guy who backed out from driving the free car hire from the hostel? He told us that his conscience bothered him so he decided to just hire a car and asked us to join him to go in Freycinet National Park. Who wouldn’t say no for a free tour, right? 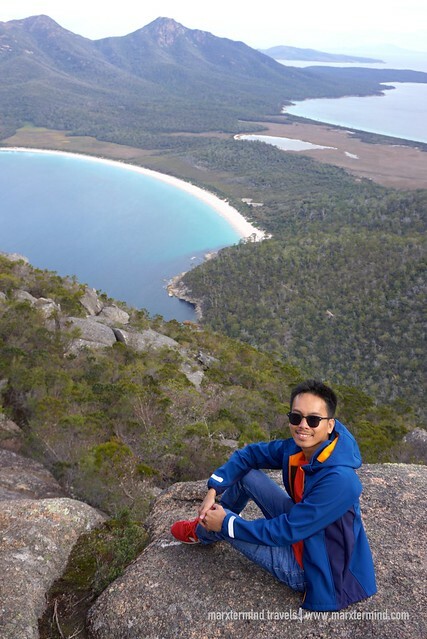 So my travel buddy and I joined him and we traveled for about three hours from Hobart to get to Freycinet National Park. 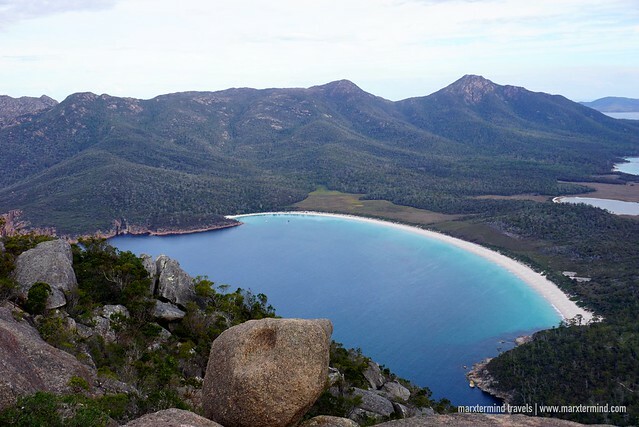 Located on Tasmania’s east coast, Freycinet National Park is a place of wild beauty. It is a protected peninsula of mountains, secluded bays, and white sandy beaches. It also has walking trails, lookouts, campsites and a visitors’ center. 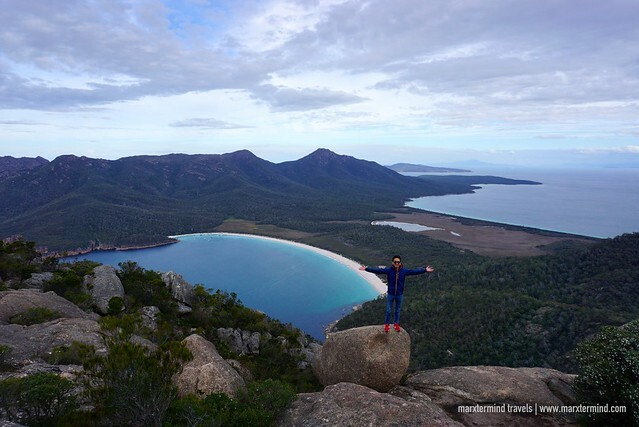 There’s also a short trek to Wineglass Bay lookout but if you want a more stunning view of the bay, you can climb up to Mount Amos, which what our group did. It was a bit challenging but I enjoyed the entire activity. The struggles were all worth it because after an hour climbing up, we got treated with a breathtaking view of Wineglass Bay. I must say, reaching the lookout point is one of the highlights of my trip to Tasmania. It was my last day in Tasmania. My flight was still in the evening. I was still able to join the travelers I’ve met in the hostel. We went to Richmond and checked out this lovely little historic town. It’s about half an hour drive from Hobart. One of the famous landmark here, Richmond Bridge is a picturesque sandstone bridge across the Coal River. It was built in 1825 by convicted prisoners. 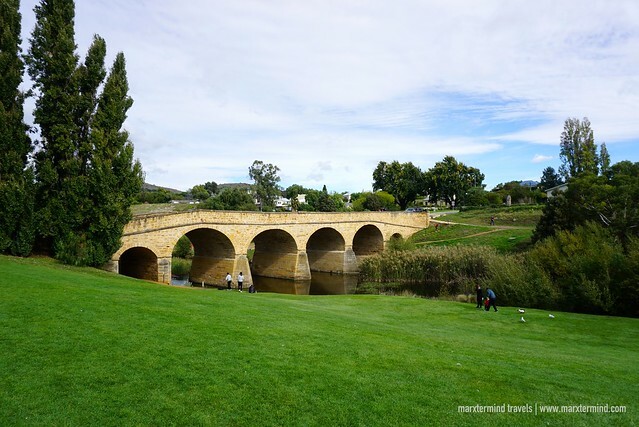 It is a heritage listed arch bridge and the oldest stone span bridge in Australia. I still had more hours left before my flight so I went around the town to buy some souvenir items. I went to the airport after dinner. There’s a shuttle bus to get to the airport but it has to be booked in advance. Uber and taxis are also available. A Uber ride costs about $30 per way. Spending a vacation in Tasmania is one of the best and unforgettable experiences I had in Australia. I had a great time exploring different places and meeting fellow travelers. 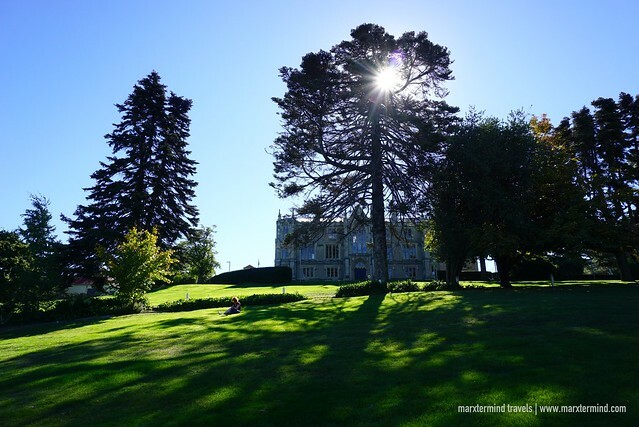 My Tasmania travel itinerary for 8 days might have gone me to several tourist spots but there are still a lot more to see and plenty to experience in this island. Use the flight search below to find cheaper fares for flights to Tasmania, Australia. Find accommodations using the Agoda search box below for hotel options and discounted room rates in Tasmania. Discover Tasmania by booking amazing travel experiences with Klook. Find the best activities, attractions and fun things to do with exclusive discounts.